Ask fellow campers about "River Trail Crossing" and nearby attractions. We were just looking for a decent, overnight stay on a 5 week journey and we found it at River Trail Crossing. The sites are level, and mostly grass. The power was good and clean. No issue with water pressure. There is an awesome paved 'trail' just beyond the end of the campground. The campground is beside a field of crops, back from the highway. We camped at River Trail Crossing in a Motorhome. A small park, no cable, no local over the air TV stations and good luck getting satellite. No WiFi. Good utilities and no issues. Level pull through sites, but there are only a couple of them. The park is quiet and lots of mature trees. If you want to get away from it all this is the place. Pricey for what you get. But the park is beautiful, remote and quiet. We camped at River Trail Crossing in a Motorhome. A small park by a river and a walking/bike path very near by. Grass sites, mature trees, mine was level. I had an electrical issue at the main plug, solved the same day. Owners are friendly and cooperative. The park is located between two small towns. Seasonal campers must mow their own grass (mower is provided). I like it here and will return if I am in the area again. We camped at River Trail Crossing in a Motorhome. 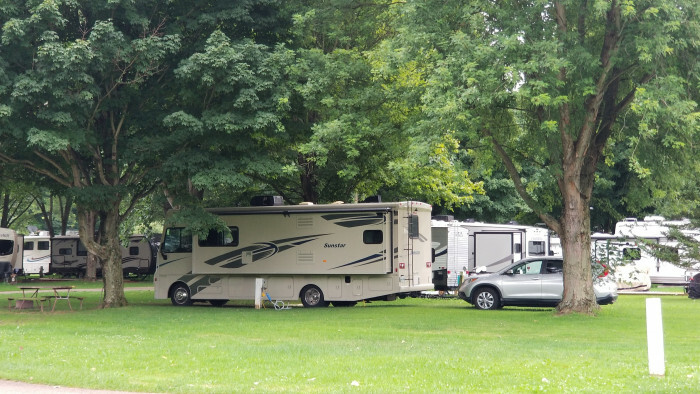 Mohican State Park has various tours and a lovely hiking path (full hook-up camping also), Malabar Farm has tour of the mansion and a restaurant. Curves (exercise facility for women) nearby accepts Silver Sneakers. The turn into the park is tight. Such a nice campground!! The owner couldn't be nicer or more accommodating. The owner wants you to enjoy your stay and does whatever he can to make it possible. Great lending library of books and DVD and lots of information about things to do locally. Large creek runs alongside the camp and there is also a well used biking trail on the other side. Several permanent campers here but plenty of space for overnighters. Lots of shade if you want it or you can camp right on the creek. Those by the creek only have water and electric.We chose a site closer to the office to make sure we had a good WiFi signal and it has been the best we have had in the last two weeks. Don't know about further into the park. We camped at River Trail Crossing in a Motorhome. Very close to Mansfield, Oh. About 20 minutes. Lots of shopping and good eating. The "Reformatory", which is the magnificent building built in the 1890's and was used to shoot the Shawshank Redemption movie is open for touring from 11-4 during the week. Not sure about weekend hours, didn't really look at those. Fascinating and well worth the time. Reasonably priced and some people we spoke with go back again and again because it is so interesting. Pretty, mostly rural setting with river access. Close to bike/hike trail. Staff helpful. Shower/bathroom house clean but somewhat dated. Sites on grass but mostly level. This time of year not very crowded. Definitely a good value for a quick one night stay. We camped at River Trail Crossing in a Travel Trailer. I called River Trail campground the day before I arrived, and reserved their pull through site #2. It was a level and dry grassy surface under shade trees, long enough for anybody. Easy in and out. Perfect spot for hot weather camping. 50 amp. full hook-up. Great well water with good pressure. Sewer pipe was convenient. The B&O bicycle trail has access right in back of the campground. 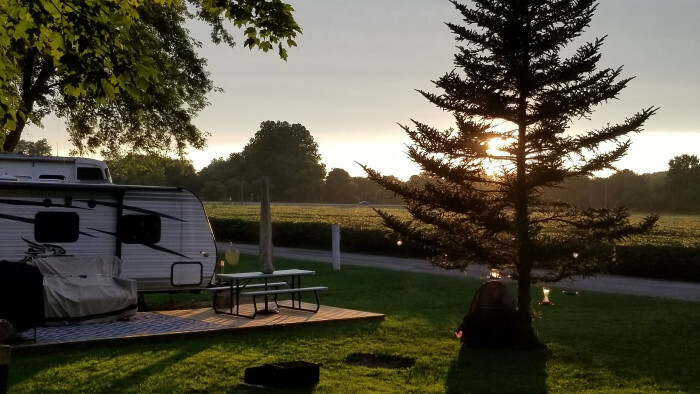 Pulling into the campground off of highway 97 is easier coming from the north out of Bellville OH. Their driveway naturally bends in that direction. 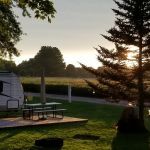 We camped at River Trail Crossing in a Travel Trailer. The folks who run the place are super nice and helpful. The campground is beautiful and peaceful. Shower facility has hot water and plenty of pressure. We well definitely frequent this campground for the quick weekend getaways. We camped at River Trail Crossing in a Fifth Wheel. This is a no-frills campground, but we loved our stay. Lots were large and level. You are right off a Rails to Trails bicycle path, which is level and well maintained. The Owners were top notch in friendliness. They bent over backwards to make sure we were settled in and happy. They have free river tubes, so you can take a ride down the river you are right next to. How often does that happen that you don't have to pay for the extras? Great fun. This is a keeper on our camping book. We camped at River Trail Crossing in a Motorhome. Make sure you pan for gold while here! Rate reflects PA weekly rate. 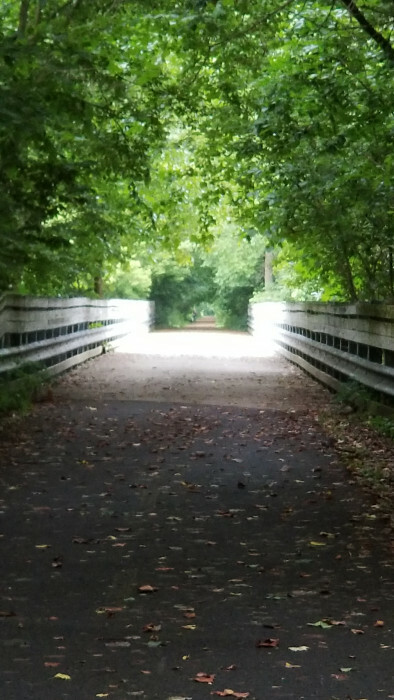 The best feature of this park for us was easy access to the paved Richland B & O Bike Trail, which runs right behind the campground. Most sites are shaded, which is a problem for roof mounted satellite dishes, but keeps you cooler. We camped at River Trail Crossing in a Fifth Wheel. We had one of the pull-through sites, which really are long enough for any length RV. The sites were grassy and level. There are some sites that are not shaded, but most of the sites have beautiful, mature trees with the branches trimmed high enough for tall rigs. This made it harder to get satellite but we found a spot. The campground is mostly weekend seasonals and is very quiet. 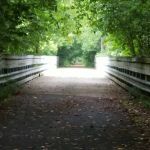 It is nestled between the Clearfork River and the B&O bike trail. Easy in and out. There was lots of rain while we were there but didn't sink into ground at all. Owners do not keep regular office hours but live on site and are very friendly. One night we lost power because of an accident on 97 and they came around to tell everyone what had happened and that power trucks were already on the way. We camped at River Trail Crossing in a Fifth Wheel. Eat at the Wiffletree Restaurant in Butler. Home cooked specials every day and great homemade pie. Bike trail is 18.5 miles of asphalt and a pleasure to ride from our campsite. Great campground. It's quiet with very large sites. Easy to navigate. Very clean showers/bathrooms. Nice laundry room with reasonable prices. The owners are warm and friendly. We really enjoyed our stay. Thanks so much! We camped at River Trail Crossing in a Motorhome. This is a great little campground. Owner is very helpful and friendly. Hookups were good, satellite was good, Verizon signal for phone and Internet strong. The rate was Passport America. We camped at River Trail Crossing in a Motorhome. This park is small and located in the country which typically means quiet and peaceful. The road noise from load motorcycles was disturbing, but the campground was peaceful. The sites were grass and gravel, fairly level some blocking required, but for large rigs a little difficult to get in or out of. Great one night stop over campground, not a destination campground. We camped at River Trail Crossing in a Fifth Wheel. We stayed three nights at the Passport America rate. The management was friendly and cooperative. We were unable to get TV at our site (neither satellite nor antenna). 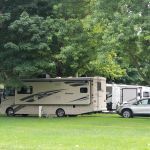 Most sites had seasonal campers and were well maintained. The area bike trail goes along the side of the park so this would be a convenient campground for bikers. We camped at River Trail Crossing in a Motorhome. While this is a nice clean little park, it is just a bit above average. The sights are grass/dirt, adequate in size but not overly large. All sites are full hookup but only the 2 pull throughs have 50 amp, everything else is 30 amp. Only a few sites are satellite friendly and most sites are occupied by permanent/seasonal units. There is no Wi-Fi or cable. We camped at River Trail Crossing in a Motorhome. Are you affiliated with River Trail Crossing ?